We’re just a few days away from Ratchet & Clank: All 4 One releasing exclusively for PlayStation 3. We hope you’re looking forward to exploring Planet Magnus, upgrading your arsenal, and solving the mystery of the Creature Collector with your friends. With that in mind, we wanted to show you a sweet video we put together, highlighting the big co-op moments in the game. It will take a team effort to steer a taxi through the vertical city streets of Luminopolis, or to coordinate the powerful turrets on the back of a massive robotic Guardian, and this video shows how players will have to work together. Can’t wait until next week to get a taste of Ratchet & Clank: All 4 One? You can check out an offline four-player co-op demo of the game right now, included on specially marked Blu-Ray and Combo Pack Blu-rays of the Sony Pictures film Zookeeper, starring Kevin James. That should definitely tide you over until the full game launches on October 18th! Also, in case you haven’t heard, Target will be releasing an exclusive version of Ratchet & Clank: All 4 One that includes a voucher code for a FREE digital copy of Ratchet & Clank Future: Quest for Booty (a $15 value). If you haven’t tried it yet, now’s your chance to get it for free with purchase! We hope you’re excited to play it, the team in North Carolina had a blast making it and is looking forward to playing with you online! I thought you can only get quest for booty when you pre order it. So those this mean I can just buy it and still get quest for booty without pre ordering? so let me get this straight, loyal R&C fans get nothing. Why can’t these codes have dual benefits? Like if you already have QFB then you get a special skin, an Insomniac PSOne/PS2 classic, A special weapon from Tools of Destruction or A Crack in Time that no one else gets…..
why cant we use the right analog stick as the camera like any other Ratchet game ? right analog to change weapons???? Hey guys..I received a beta code from the rls for R&C ALL4ONE but have not had time to play video games. I only have one code…First gamer to message me gets it. I have always been told that games should be played…not collected…. Oh ok Thanks Christian Cardona!!!!! See you next time!!! Please convince Sony to do a HD collection for the PS2/PSP games and add trophy support for “Tool of Destruction” and “Quest for Booty”. I’ll pay to add trophy support. Although i am not happy about the stupid online pass. You just ruin it for people who can’t afford it and have to rent it or buy it used. Any chance we’ll see a HD collection of Ratchet and Clank? The Sly Collection has one. I heard a Jak and Daxter is getting one. Any chance we’ll see a Ratchet and Clank one? I just do not get how there are people who can say this ruins the game. I 4 one (see what I did there?) have enjoyed the older games and have also enjoyed the Beta for this. It is just a difference in design choice. Oddly enough, my wife, who could not get into the older games had a blast playing the Beta with me. I also have a few friends who have never played a R&C title who are picking this one up, just so we can all play together. Come on, super fans, enjoy games for what they are, not what they should be in your heads. Insomniac, you have a purchase from me. Not day one, but certainly before Christmas. Already have it pre-ordered. Can’t wait to get it in my PS3! I do really hope to see another R&C trilogy like the future trilogy, though. Argh! I’m torn between this and Best Buy. The Pyro Blaster was my favorite and deadliest weapon from Tools of Destruction. I haven’t played Quest for Booty yet. I don’t know which is better, Getting a $15 game for free or getting early access to my favorite weapon? Will be picking this up since i love this series and i also have to agree about an HD collection of the previous R&C games. C’mon guys just put the damn collection together for us!!! This series with full trophy support would be awesome!!! Make it so. Please Please Please give us a Ratchet and Clank HD collection! Please pass on the info to Insomniac and Sony. Gamers want the HD collection! Insomniac games said they won’t do a HD collection because they are making their new multiplatform stuff but they said they will support Sony if they do it, which is why i directed my suggestion to Sony, it’s all on them. i mean what happened to insomniac??? YOU MEAN WE HAVE TO PAY FOR THE ONLINE FEATURES???????? SO I CANT PLAY MY COUSINS???????? If you buy it new, you don’t have to pay for the online features. Just enter the voucher code into the PlayStation Store and you’ll have access. Buy it used or borrow it, however, and you will have to purchase an online pass to access that portion of the game (unless you’re using the same PSN ID). I just played through the Future trilogy again, and I realized that a Ratchet & Clank Future Greatest Hits Dual Pack would be pretty sweet for anyone who missed out on the original games. is there going to be a demo released on PSN,? I’m not sure if I want to get this game, even though I love the Ratchet series, & I have no desire to buy the Zookeeper just to play a demo. Yes. We’ll have a demo out in the coming weeks. Keep an eye out! when will the reviews start rolling in? 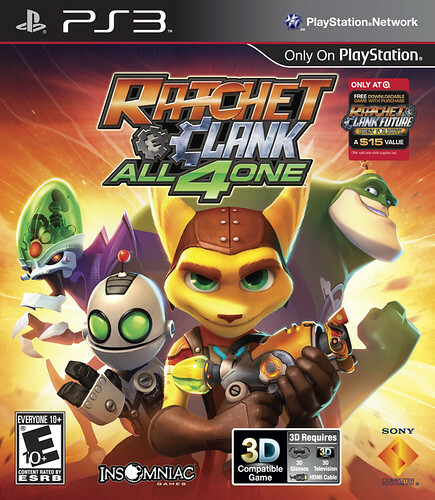 I love ratchet series and cant wait to get my hands on all4one…I really cant wait…and I’ll be getting this and Uncharted 3 together….of course ratchet first. As much as I love the R&C series, think this is going to bomb. You guys would be better off putting it on PSN for $40 or less. Maybe something to think about in the coming months. Move support would have ensured more sales too. why does every awesome game have a online pass that costs 10$ the mortal kombat one was a waste of money for 3 maps but ratchet and clank serise has been growing for 10 years and fans ( like me ) arent going to waste psn card money on online passes any more. the online passes should be free with the game in the instruction manual. hay do u guys think that psn is going to sell ratchet and clank all 4 one on the playstation store? I love this series so much im buying this game on day 1. Hey I just got this game from gamefly and I don’t know where to find the online pass. I know it has to be downloaded for people who rent the game but the pass is nowhere to be found in the playstation store. Does anyone know where to get it, please respond. I’m really disappointed with you guys on this one. Right now, I can’t afford to spend as much money as I used to on games that I like, so I had to rent this game from a Redbox kiosk. It’s bad enough that you’re asking me to pay $10 just so I can play with my friends online, many of which are real-life friends that I don’t live near anymore. But just out of curiosity, I checked on the PSN store to see if the pass was available. I couldn’t find the friggin’ thing anywhere. I checked disc-based add-on downloads and saw the Resistance 3 online pass, but not the All 4 One pass. This effectively screws second-hand buyers out of the online multiplayer completely. Have you seen The Jimquisition or Extra Credits? They talked about why this whole Online Pass scheme is a bad way to get some compensation from used buyers and suggested some better ideas. i think its funny (not the haha funny, the other kind of funny) that so many people have been talking about wanting a HD remake of all the ps2 R&C titles with trophies. i have actually brought that issue up on the ps3trophies.com forum. u guys should look for it and register. but i also think they will. i mean u cant blame them. they just got done with an amazing game. i saw how long it takes for the cover art… that took eight months already. so theyve been pretty busy. but i’ll share in your anticipation. i really would like ps2 titles to come back. i just bought another copy of R&C 2, 3 (both were scratched beyond use from years of play) and i love them just as much as ps3 R&C titles. but dont hold your breath for trophies on R&C tools of destruction and quest for booty. that just sounds like its a pain i you really think about all they would have to do. it makes sense that u cant move the camera freely. if that was possible u would have to split the screen in 4 which they obviously did not want that effect to be in the game. the single screen idea makes it more teamworky. and R1 to shoot? dude…they had that for like, the past 3 ps3 R&C titles. even for R&C 3 u had the option. and personally, i think it functions a lot better that way. All 4 One is a huge dissappointment. Simple and restrictive game play ruins the series. 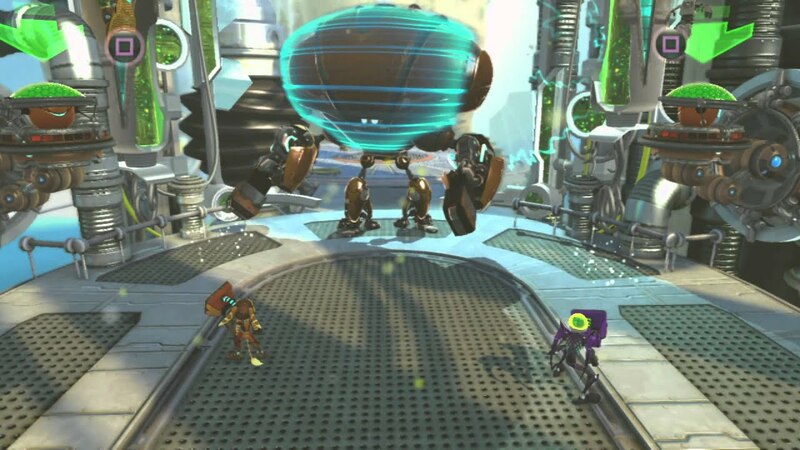 I feel that if Insomniac does not get back to the core game play of R&C 2 and R&C 3, A Crack in Time will probably be the best version the series will ever see.